I have read a large number of Max Lucado's books including his previous book, In The Grip of Grace. 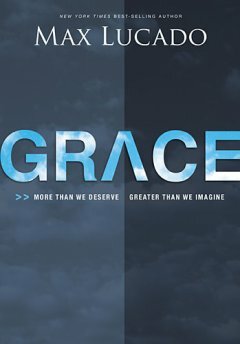 I personally believe that this current book on Grace is not as good as his previous book, In The Grip of Grace. In The Grip of Grace really has a grace-transforming effect on my personal life, and that book was one of the key that lifted the burden of guilt and sins on my spiritual life. However, for this current book, I kind of find that Max was rather fuzzy and has not really articulated well the various effects of Grace as he has done before in In The Grip of Grace. "Conventional wisdom draws a line through the middle of these fluctuations. Perform above this line, and enjoy God's acceptance. But dip below it, and expect a pink slip from heaven. In this paradigm a person is lost and saved multiple times a day, in and out of the kingdom on a regular basis. Salvation becomes a matter of timing. You just hope you die on an upswing. No security, stability or confidence. On-and-off salvation never appears in the Bible. Salvation is not a repeated phenomenon. Scripture contains no example of a person who was saved, then lost, then resaved, then lost again." Overall, I do enjoy this book, but I still believe In The Grip of Grace is a more life transforming book, so much so, at times I wonder, why did Max sort of re-write what he has already written so well before?